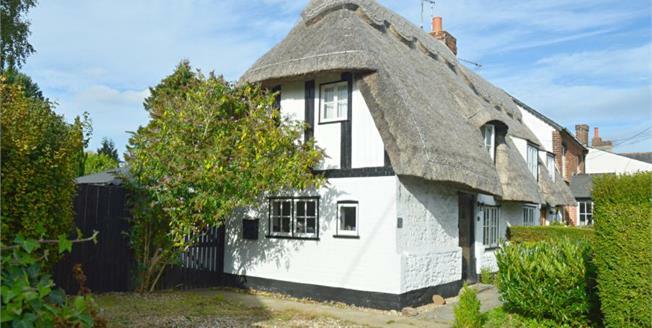 A charming, Grade II listed thatched cottage with a wealth of characterful features and a delightful good sized rear garden. The property is located in the popular village of Sewards End, just a short distance from the market town of Saffron Walden. The main entrance leads into a cosy sitting/dining room with feature fireplace, exposed timbers and windows to both the front and side aspect. There is also space for a dining table within the living room as well as a useful built in storage cupboard. The kitchen is fitted with a range of wooden wall and base units, complimented by solid Oak and black Granite-effect work surfaces. Appliances include integrated under counter fridge, Bosch electric oven with ceramic hob over, 1.5 bowl black composite sink and a dishwasher. There is also access to the rear garden. Completing the ground floor accommodation is a family bathroom with attractive wooden panelling, comprising a three piece white suite including a shower over the bath and vanity unit and space and plumbing for a washer/dryer. All of the ground floor rooms feature Amtico luxury vinyl flooring. On the first floor, there is a double bedroom with built in storage and window to the front aspect, this then leads into the second bedroom which is a good size single room with exposed timbers and a window to the side aspect. Externally, to the front of the property is a small garden area with a shingle path leading to the front door and a range of mature shrubs. There is currently off road parking for two vehicles to the side of the property and this could potentially be extended to provide additional parking, subject to the necessary planning consents. To the rear of the parking area there is a gate leading into the large garden which is predominantly laid to lawn with a range of well stocked boarders. The spacious covered patio area is ideal for al fresco dining and there is a useful outbuilding which can be used as a home office/playroom towards the rear of the garden, with double glazing, fully insulated and benefits from having both power and light connected. In addition, there is a summer house and two sheds. Sewards End is a village about one mile east of Saffron Walden and is set in the rolling countryside of north west Essex. It has a popular village hall and its own church. A very good primary school can be found in the nearby village of Radwinter. Saffron Walden town has an abundance of amenities, to include an excellent range of shopping, educational and recreational facilities, including a very good weekly market. The renowned Saffron Hall is situated within the grounds of the County High School, offering a cinema and theatrical productions. Access to London can be gained via the rail link to London's Liverpool Street at Audley End (some five minutes' drive to the west). Road links to London and Cambridge are accessible at Junctions 8 and 9 of the M11. Stansted Airport is conveniently located within around a 25 minutes' drive. Agents note: the thatch has been combed, rewired and has had a new ridge installed in 2014.